Here I am at home--relaxing with a good book. I'm wearing the newest release from ELEMENTAL JEWELRY--the INFINITY NECKLACE & EARRINGS. 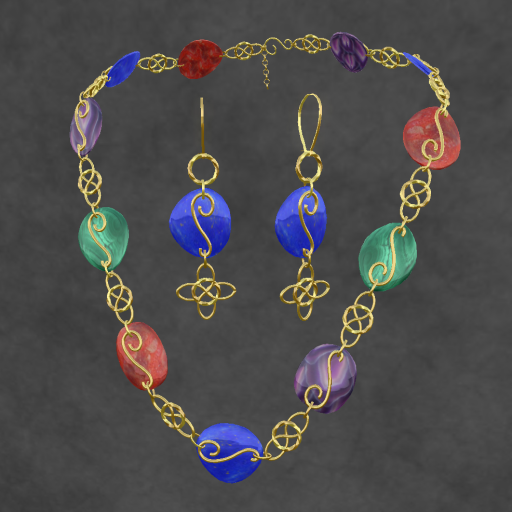 This is a pretty set with swirly gold links and texture changing semi-precious stone beads of lapis lazuli, malachite, red coral, purple agate, or black onyx (black onyx is not pictured). 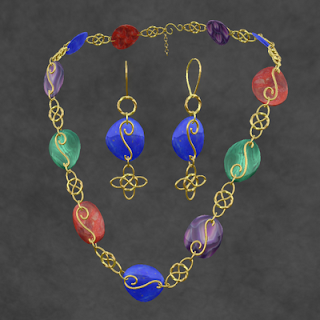 The beads change texture individually so you can wear one color, or mix them up as shown. The necklace is resizable so you can fit it perfectly to your own avatar. Have a look at the closeup below. Hair: Zoe from Truth Hair. Outfit: Nikki Ree Diana Jacket & Pants in blue. certain that they are still available, but I love them.